Gentle reader, I'm sure you've noticed that we are getting some snow today. That must mean you have sledding on your mind. My personal favorite sledding spot is Huron Hills Golf Course. It is steep and has a great long run. I know people also love the hills at Vets Park and Hunt Park. In Ypsilanti, Riverside Park and Ypsi High are also very popular. 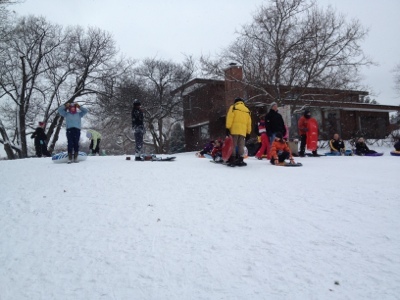 Gentle reader, what are your favorite sledding hills? Here's a from the Damn Arbor archives with more information on sledding. Note: This article was first published on Dec. 27th, 2012. I'm a Huron Hills sledder, or at least I was when I was a kid. Nice hill, and only five minutes from home. With a good run-up, you can fly all the way to the road. The fact that the grass is mowed so low really helps reduce drag and make for a more comfortable ride. The Arb may have steeper hills, but the ride is much less comfortable because of all the hummocks.